Okja is an odd film. It has a kid’s movie sensibility but plays out like a brutal satire on commercialism. Either that or it is a brutal satire on commercialism with a kids movie sensibility, I can’t quite decide which. Of course there have been other stories that have combined childhood and adult concerns before and done well this can be beautiful and poetic. Pan’s Labyrinth is unequivocally the best example of this but Doctor Who, Harry Potter, His Dark Materials and even Labyrinth and The Princess Bride all do the same thing to some extent or other. They take simplistic and typically family friendly, fantasy ideas of monsters and good verses evil and mix in ponderings on death, mortality, ethics, religion, sacrifice and loss. Okja follows these with mixed success. It is tonally uneven, with its dark and light sides never really reconciling, but it is also entertaining and charming and it does have something worthwhile to say about animal cruelty and selfish capitalism. The basic set up is not unlike last year’s remake of Pete’s Dragon. A young child growing up in a secluded natural environment has developed a close, almost symbiotic, relationship with a very large and highly intelligent creature. Their idyllic existence is then disrupted when adults come to capture and use the beast for their own less than altruistic reasons. The difference here is that the animal is a genetically engineered super pig and its creators want it back for its bacon. 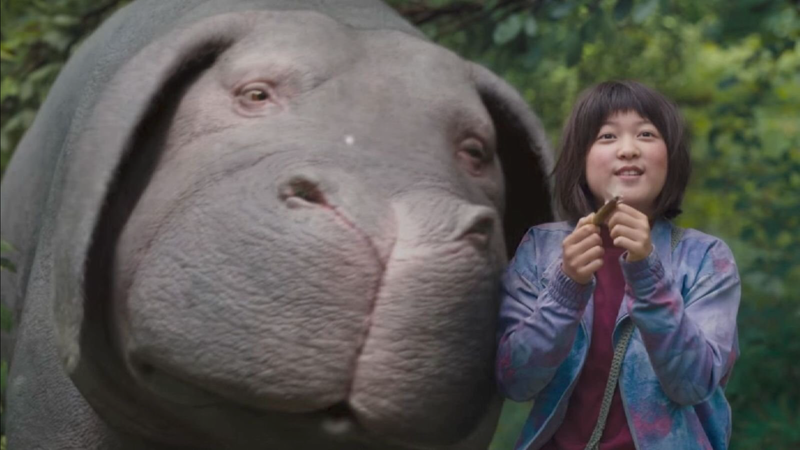 The opening moments of girl and pig are genuinely touching in a way that Pete’s Dragon actually never managed and this is down to the direction, the creature design (as pachyderm as it is porcine) and the performance of thirteen year old South Korean actor Ahn Seo-hyun. These scenes are not without their own excitement but things really get going when a never as you have seen him before Jake Gyllenhaal turns up to take the lively livestock to Seoul and then New York. Soon the girl Mija and the piggopotamus Okja link up with the Animal Liberation Front and escape, tearing around built up areas and inadvertently gaining quite a following online. It is when Tilda Swinton as the CEO of Okja’s parent company tries to take back control that events turn funny and then dark. Anyone who isn’t already a vegetarian will have their carnivorous stance challenged by this film as the depictions of the machinations of meat processing companies are not nice. It is these parts of the film, more than the swearing, that stop it being one for the kids. The treatment of Okja and all of the other super pigs is surprisingly disturbing and likely to stay with you until well after the jaunty tune that plays over the credits has finished. Interestingly the behaviour of the ALF, populated by Paul Dano and Lily Collins, is not perfect either. They are polite but passionate about their cause and do go a little nuts on occasion. I don’t know what the real ALF will make of it. They may not be any happier with the movie than the pork industry. Incidentally one group of people that were not initially fans were the audience at Cannes where the film played in competition. Their objections concentrated purely on the fact that the movie is being distributed by Netflix though. Whether we should be precious about this or not it is no surprise that director Bong Joon-ho went with them. His last film Snowpiercer barely saw the inside of cinemas in America and not at all in the UK following creative arguments with Harvey Weinstein so you can see why he’d go the route of most exposure. This marks a step up for Netflix who haven’t really secured release rights for anything worthy of picture houses before, Beasts of No Nation excepted. Personally I have no issue with this manner of distribution. I don’t think streaming is going to kill cinema and if it helps me see more films I’m on board. Okja is in select cinemas too and is an interesting and entertaining film. It has some strong performances and a valuable message. Big screen or small I recommend it.